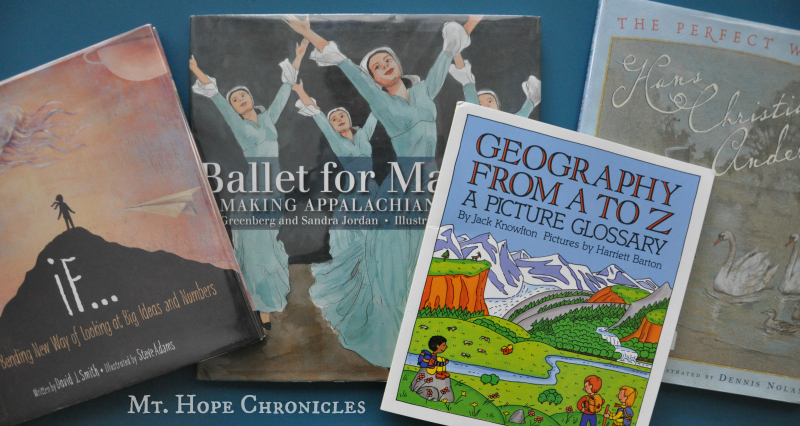 Maps and Globes is one of my most favorite picture books to introduce kids to basic geography (What are maps? What do maps tell us? How is the earth measured? What are the marking on maps? ), and now I have a favorite picture book for the features of the earth! In alphabetical order, Geography from A to Z: A Picture Glossary defines more than sixty geographical features and weaves in another 60+ definitions and synonyms. For example, the definition of oasis is given within the definition of desert; the definitions of knob and knoll are included in the definition of hill. The added terms are in bold, so they are easy to spot. Challenge A students are instructed to define these terms and create their own picture glossary. This is one of the projects that Levi fell behind on, and I wish we had this book at the beginning of the year. My other kids will enjoy reading and learning the terms before they hit Challenge. My boys love fairy tales and we have several beautiful picture books of fairy tales by Hans Christian Andersen. I try to find biographical picture books of authors whenever possible, and this picture book by Jane Yolen is lovely. The pictures are soft and muted. I also love The Young Hans Christian Andersen, the story of his childhood (with darling illustrations) by Karen Hesse. We have borrowed this one from the library before, but it was time to revisit. My boys love Appalachian Spring (because they love the original Shaker hymn, Simple Gifts), so this story is a favorite. The illustrations are wonderful! Even more exciting is that the original ballet can be viewed on YouTube! We have Geography from A to Z and I really like it. It's a great reference type book for younger students. I love that it has such colorful pictures! Confession I have the geography book which I've never really opened and read. Furthermore I've been looking for a resource like this. :) I guess it will have to use the resources on my bookshelf ha ha!